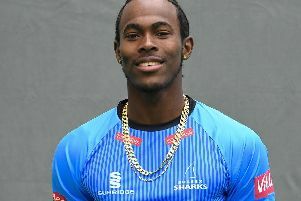 Sussex Sharks Vitality Blast overseas player, Rashid Khan will miss the side’s final group match against Middlesex at The 1st Central County Ground tonight. The leg-spinner has been recalled by the Afghanistan Cricket Board (ACB) to travel to Ireland this morning ahead of Afghanistan’s T20 series which starts on Monday. Last night’s victory against Gloucestershire in Bristol was therefore Rashid’s final appearance for Sussex in this year’s south group. The 19-year-old has taken 17 wickets in his eleven group games for Sussex, including a best of 3-9 against Glamorgan at Hove. Sussex Cricket would like to thank the ACB for their flexibility in allowing Rashid to remain with the club beyond his initial seven-match agreement. Everyone at the club would like to thank Rashid for his contributions on and off the pitch during his first spell with us. The Sussex Sharks squad for tonight’s match will be published on the club website later this morning.